I wanted to share this beautiful wallpaper with you. Columns of delphinium flowers captured at their peak, printed in intense shades of blue and white, are interspersed with a mix of smaller red flowers, all printed against a black background which makes the colors pop. It is a rather dense design but I think the superb rendering of the flowers prevents it from being overwhelming. When I Google delphinium I get image after image of dense clusters of these flowers. I’m happy to say I was just able to assign the 1926 date to this paper. A while back I was doing some research on British papers and came across a website that lists the date an object’s design was registered to prevent copying. As I understand it, these numbers were issued between 1884 and 1965, and on wallpapers they are printed in the selvedge. As wallpapers only stayed in production for a year or two years at that time. I usually take that date as the year of production. This wallpaper was donated to the museum by Lanette Scheeline (American, 1910-2001), a talented wallpaper and textile designer. 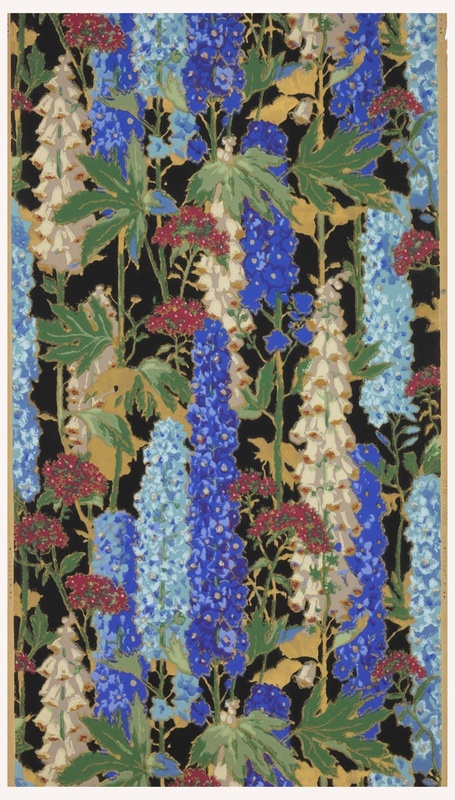 She created numerous wallpaper designs for two of the major wallpaper firms of the time, Katzenbach & Warren, and Louis Bowen, Inc. And I have to think it was this delphinium wallpaper that inspired her mural for Louis Bowen, titled Delphinium, one panel of which is shown below. It has the same floral density as the British paper, but the flowers are rendered more like a cluster growing in your garden. These warm summer days seemed like a good time to explore some nice floral designs. Greg Herringshaw is the Assistant Curator for the Wallcoverings Department.